The HDC-TM900 High Definition Camcorder is a HD offering from Panasonic.While you record 2D videos in 1080/60p (1080/50p for PAL model) at 28Mbps with Panasonic HDC-TM900 .If you would like to put the AVCHD videos from TM900 to Final Cut Studio for editing, a third party software shall be needed to handle the 1080/60p and 1080/50p footage to ProRes 422 for FCP 6/7. Aunsoft Video Converter for Mac is the recommended Panasonic TM900 AVCHD to ProRes converter for high quality video editing on Mac with less compressed Apple ProRes format. Apple ProRes 422 , Apple ProRes 4444,introduced in Final Cut Studio, was advertised to one of the codecs to result in less compression and higher data rate/higher quality files for HD editing in Final Cut Pro. Here is the step-by-step guide for you to convert import and edit Panasonic HDC-TM900 MTS to Apple PreRes 422 MOV to Final Cut Pro/FCP7 without rendering on iMac/MacBook Pro with Mac OS X like Snow Leopard. Step 1. 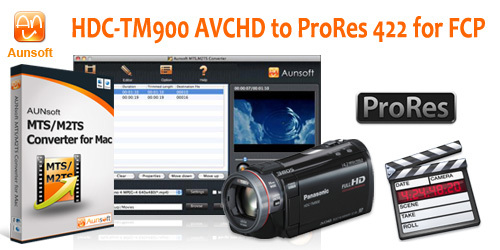 Load Panasonic HDC-TM900 videos to Aunsoft Video Converter for Mac. Run Aunsoft Video Converter for Mac as the best MTS video to ProRes converter on Mac, click the "Add" button and you can browse the TM900 28Mbps videos for conversion. Click the "Format" option, and navigate the mouse cursor to Final Cut Pro > Apple ProRes 422 (*.mov) as output format. 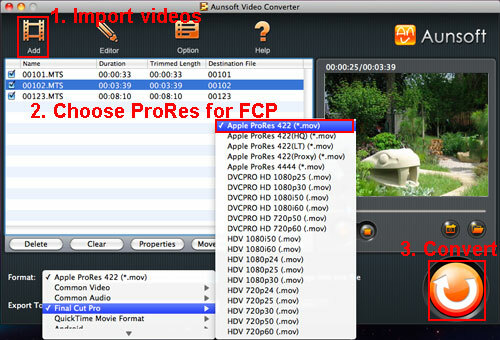 The video to ProRes 422 converter will transcode Panasonic HDC-TM900 1080p AVCHD to Final Cut Pro native format. Step 3. Choose 1080p size with 60 or 50fps. Click the "Settings" button and choose 1920*1080 from the video size drop-down box to keep the original HD resolution. Click the drop-down box for frame rate, and choose 60fps or 50fps as output video frame rate. The frame rate option depends on your source videos in NTSC or PAL model. Click the OK button to save the changes and the Mac AVCHD video converter will convert 1080p AVCHD videos to 1080p ProRes 422 Mac FCP compatible native format. Step 4. Convert 28Mbps MTS to Apple ProRes for FCP. Click the convert button under the preview window, the conversion from Panasonic TM900 AVCHD to ProRes 422 MOV Final Cut Pro Native Format will start immediately. After converting and merging the Panasonic HDC-TM900 AVCHD files, just import the output Apple PreRes 422 .mov files to Final Cut Pro 7 or Final Cut Pro 6 for editing and the video is in HD 1920×1080.Optimize your workflow and save time with the Apple ProRes compression for Final Cut Pro.